Nowadays when companies choose their names they have to think about thinks like “search engine optimization.” Obviously, back in 1900, SEO wasn’t a thing – otherwise the National Automobile & Electric Company may have chosen a different brand name to take to market, as “National” is pretty generic and doesn’t produce great Google results. But anyway, I am a big fan of cars from about 1916 through the early 1920s. They more or less all look the same: four door tourers with wooden spoke wheels and a nice big radiator cap and MotoMeter out front. National built cars in Indianapolis between 1901 and 1924. 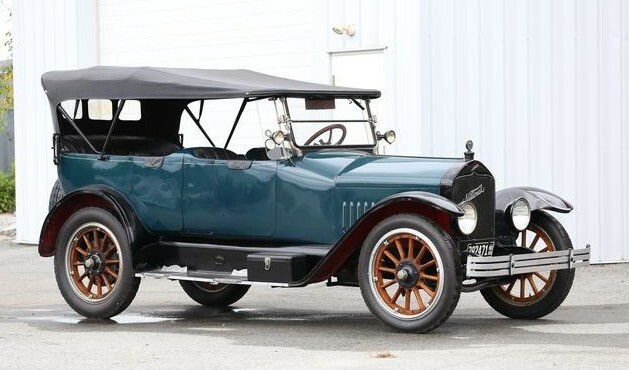 The Highway Six was built between 1916 and 1920 and used a 5.0-liter straight-six making 41 horsepower. This car is mostly original and has been restored “as-needed.” Bonhams sale at the Simeone Foundation in Philadelphia has been an awesome source of unrestored old cars for a few years now. This is a nice find. It should bring between $30,000-$50,000. Click here for more info and here for the rest of this sale’s lineup. This entry was posted in Uncategorized and tagged 1918, auctions, Bonhams, cars, classic cars, highway six, national, touring by classiccarweekly. Bookmark the permalink.